We were challenged to Launch 34 - the first local craft beer - in a highly saturated Georgian market, where local products are regarded as cheap and inferior. Show that 34 is not another Georgian Product and impress beer fanatics - special people who can appreciate special taste. Make them try our new beer. Create an artificial monetary obstacle to find the real beer fanatics - those, who wouldn’t turn their backs to tasting of a new beer, even if it cost a fortune. After finding these special people, reward their courage handsomely, share this story and decrease the price of 34 making it widely available. 34 launched with a shocking price tag in only three locations - 34 Laris a bottle (20 times more than average price on market = aproximatley 15$ a bottle). In five days, we tracked the first heroes to buy 34 and crafted their personal statues. Just as the price went down to an affordable level, we revealed new local landmarks to honor the uninhibited passion for beer, and the brave people who trusted us. 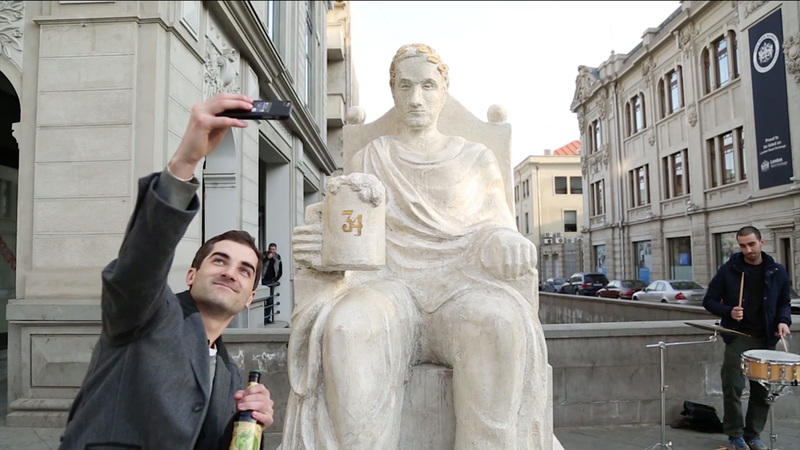 Appearance of New statues of ordinary people in the city center quickly generated the buzz among beerlovers. Initial unusual offer instantly stirred up a nationwide conversation about 34. As a follow-up the final memorable finale got discussed on the Internet and the national TV even more, touching the heart of every beer lover in the country. 230 overpriced bottles and a few statues sold 230% of the planned amount for the first month. A completely unknown brand swept 12% of the entire beer market away in a single month.